Last year, researchers from the University of Adelaide, the South Australian Research and Development Institute and NSW Department of Primary Industries made headlines after their investigations revealed how grapes ‘breathe’, and that if subjected to a shortage of oxygen during ripening – as can happen with an increase in temperature or water stress – berries will shrivel and die. Detailing their findings, the researchers describe how Shiraz berries ‘breathe’ oxygen differently to Chardonnay, probably explaining why the former is more sensitive to high temperatures and a higher incidence of cell death. Their findings open the door to further research into grape varieties better suited to a warming climate. Berry cell death is a developmental phenomenon that occurs late in ripening, is associates with shrivelling, and has implications for both yield and composition of berries and wine. We do not know to what extent cell death is genetically programmed, and to what extent is it a response to environmental and physiological challenges. This is important for at least two reasons. First, cell death may influence yield due to its strong correlation with berry shrivel in cultivars such as Shiraz. For example, cell death and shrivelling could be associated with yield losses of up to 30% in Shiraz. As a result, sugars are concentrated in the grapes during ripening and this could lead to high alcohol content in wine. Secondly, cell death may affect berry and wine sensory attributes due to the mixing of cell compartments and changes in biochemistry within the berry. 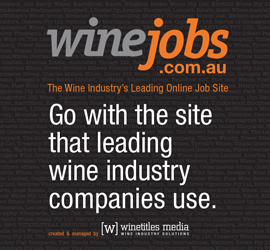 Shrivel in mature Shiraz berries in warm climates is likely due to a combination of several factors. The correlation between cell death and berry shrivel can be explained by the dehydration of berries mediated by changes in cell membrane permeability (Clarke et al. 2010, Tilbrook and Tyerman 2008). Berry transpiration late in ripening may continue but with decreased vascular inflow (Rogiers et al. 2004). This may be combined with backflow to the vine (Keller et al. 2006, Keller et al. 2015, Tilbrook and Tyerman 2009, Tyerman et al. 2004) through functional xylem, which is only partially blocked in the pedicel (the berry stem) (Knipfer et al. 2015). Therefore, cultivardependent berry shrivelling may be linked to very different behaviours of berry water conductance late into ripening in addition to the effect of cell death (Scharwies and Tyerman 2017, Tilbrook and Tyerman 2009). Since the significant discovery of the phenomenon of late ripening cell death (Krasnow et al. 2008, Tilbrook and Tyerman 2008) and the cultivar dependent correlation between cell death and berry shrivel (Fuentes et al. 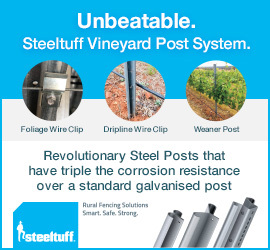 2010), various studies have investigated its relationship to abiotic stresses in the vineyard. Some showed that Shiraz berry cell death can be accelerated by water stress and elevated temperature (Bonada et al. 2013a, Bonada et al. 2013b). There are increasing frequencies and intensities of heat waves and drought events globally and in Australia (Alexander and Arblaster 2009, Perkins et al. 2012) and the warming trend is predicted to have adverse effects on grapevines (Webb et al. 2007) and berry quality (Bonada and Sadras 2015, Caravia et al. 2016). One of the challenges in the study of grape berry cell death is the requirement for a method to rapidly monitor it in the vineyard. Caravia et al. (2015) showed that using impedance spectroscopy, the electrical properties of grape berry flesh, can be rapidly measured and the vitality of the flesh can also be predicted using these properties. This technique has demonstrated a promising application for accurate and rapid measurement of berry composition. Recently we tested the hypothesis that cell death was associated with oxygen (O2) starvation (hypoxia) in the berry tissue based on the observation that cell death was increased at higher temperature. Oxygen is essential for living cells and their normal respiration, which also depends on temperature. In the first component of the study, berry internal O2 concentration of Chardonnay, Shiraz and Ruby Seedless was measured with an O2 microprobe during berry ripening. The pattern of O2 concentration across the berry was found to correlate with cell vitality (Figure 1). The middle regions of the mesocarp had both the highest cell death and the lowest O2 concentration. Oxygen availability in the mesocarp might be limited by a high internal respiration demand, such as may occur at high temperature and possibly contributed by seeds, and/or by restricted O2 intake. A large gradient of O2 concentration across the skin (Figure 1) indicates significant restriction to oxygen diffusion. Thus, we turned our attention to the tiny gas permeable pores on the berry pedicel. These pores are referred to as lenticels and show a high density on the berry pedicel. Lower lenticel surface area in Shiraz could be indicative of a greater restriction on O2 uptake compared with Chardonnay. Oxygen concentration increased towards the central axis of the berry corresponding to the presence of central air spaces visualised using x-ray micro-computed tomography. These air spaces are connected to the pedicel where the lenticels are located. Direct measurements of O2 concentration in the axis of the berry while changing O2 supply at the pedicel showed that most O2 diffusion occurred via the pedicel lenticels. There was also increased ethanol concentration within Chardonnay berries after blocking pedicel lenticels indicating that fermentation occurred within the berry due to oxygen starvation. Thus, lenticels on the pedicel are an important pathway for oxygen uptake into the berry, and blocking or restricting these gas permeable structures can lead to decreased oxygen supply in the berry mesocarp. High respiratory demand in the berry can also create an O2 deficiency. The seeds contributed substantially to berry respiration around veraison but decreased to a negligible demand late in ripening. Both seeded cultivars (Shiraz and Chardonnay) showed substantial cell death during ripening while Ruby Seedless grapes maintained higher cell vitality as well as higher internal oxygen concentrations. The results partially explain cultivar differences in cell death due to the presence of seeds and differences in lenticel morphology and surface area. status. Using the O2 microprobe and micro X-ray CT analysis, Shiraz berry cell death was shown to be correlated with low O2 concentration in the mesocarp and decreased berry air spaces within the flesh, perhaps induced by stress, that could potentially restrict the diffusion of O2, leading to hypoxia and cell death. The internal oxygen also decreased during berry ripening irrespective of growing conditions. The progression of cell death during berry ripening correlated with mean berry internal O2 concentration across all growing conditions. Water stress decreased Shiraz berry internal O2 concentration and increased ethanol accumulation and cell death. Total berry air space volume decreased across the ripening period independent of treatment while locule cavity (cavity around the seed) increased. This suggested that earlier in ripening, Shiraz berry internal air spaces occur as fine pores and that later in ripening, locule air space becomes larger relative to the total berry volume. Air channels connected the internal air space to the pedicels, where lenticels occur at high density, similar to that which was observed for Chardonnay berries. This further confirmed the physiological importance of pedicel lenticels in gas exchange and oxygen uptake. The reduced berry internal O2 concentration is related to the reduction in air space and percentage of living tissue. Cell death, and by implication berry shrivel, are strongly linked to oxygen supply and demand. Potentially any stress that influences oxidative processes, including treatments that can cause oxidative stress in the berry, berry respiration or anatomy, will likely impact on cell death. Lenticels on the pedicel provide the main pathway for O2 diffusion into the berry. Differences in internal O2 availability of berries between cultivars could be associated with seed development and differences in lenticel surface area. Higher rates of mesocarp cell death caused by water stress was also associated with hypoxia within grape berries. This new knowledge on how grapes uptake oxygen provides the basis for further research into berry quality and cultivar selection for adapting viticulture to a warming climate. 2School of Agriculture, Food and Wine, Waite Research Institute, The University of Adelaide, PMB1, Glen Osmond, SA 5064, Australia. 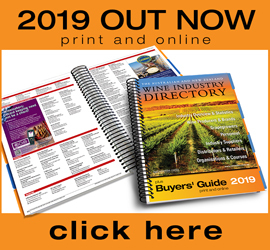 This article was originally published in the Summer 2019 Wine & Viticulture Journal. Click here to read more about the issue, and click here to subscribe. Photo: Probing a Shiraz berry to measure O2 concentration profiles within the flesh. The berry pedicel (top) can be seen with lenticels on the surface. 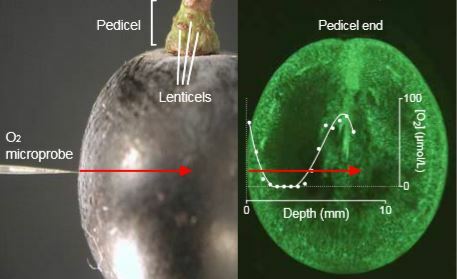 (Right) Oxygen profile across a Chardonnay berry shows that the O2 concentration decreases from the surface towards the middle region of the flesh and increases towards the central vascular bundles. The horizontal axis is the depth from the berry skin, vertical axis is oxygen concentration. Red arrow indicates the approximate track of the oxygen probe within the berry. Background image shows vital stained longitudinal section of a different berry. Green fluorescent signal indicates vital cells. Similar O2 profiles near the skin were observed for Shiraz. Adapted from Xiao et al. (2018b).